Description: This is really 3 stories woven into 1. The first is Bethanne and Max. They've been married for about a year but a long distance marriage is making them start to feel the strain. Bethanne's ex-husband trying to win her back and the interference of her daughter Annie isn't helping much either. Lauren has finally had enough of her long time boyfriend's complete avoidance of anything remotely resembling the future. When she hears about her younger sister's pregnancy she decides to take a long hard look at her life and see if Todd is really what she wants in life. The third is about the owner of the yarn store that both of these women frequent. Lydia Goetz is trying to keep her business surviving in an economic downturn. To her surprise someone has already come up with an idea. Mysterious baskets are showing up all over the cities filled with yarn and instructions for people to knit a little bit on a scarf to be donated for charity. While the upswing in business is wonderful Lydia begins to worry about her daughter Casey who is struggling with nightmares and her mother whose memory is starting to get more and more shaky. Pros: I liked Lydia's story the most. She and her husband seem to have a solid loving family and their concern for Casey seemed very real and just very warm. It was also nice to see Casey as a fairly realistic teenager. She wasn't always pleasant or upbeat but she wasn't overly mean. Sometimes she was just surly and would lash out. It felt fairly real to me (and I have 3 teenagers so on this front I have some experience!). I liked Lauren and that her insta-love relationship with Rooster was discussed as being a bit unusual. While I don't know if everything will work out for them they did seem to be trying. While Bethanne annoyed me at the beginning her and Max's relationship was just plain sweet and Max comes across as a truly great guy. I thought the ending was nicely done. What needed to be wrapped up was and it felt like everyone was better off than they were at the beginning or at least getting there. Cons: The immaturity was pretty intense in part of this book. Annie I could kind of overlook because she was a young woman caught up with a manipulative parent. Elisa, however, needed a good spanking and to be sent to bed without dinner. Thankfully though she was a relatively small role but I really thought Lauren could do better friend-wise. Also, I was annoyed by Bethanne's reaction to some of Max's concern regarding her relationship with her ex-husband Grant. I know if my husband went out to dinner to celebrate something with his ex-wife while I was out of town, went to their old favorite spot and spent hours reminiscing about the good times you'd have to scrape me off the ceiling. I thought Max was being more than reasonable and was ready to send Bethanne up with Elisa but thankfully she straightened out. 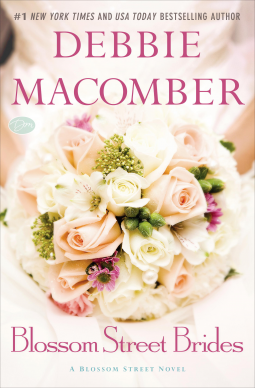 Overall: Macomber is one of the names you see everywhere if you're looking around the women's fiction world. Her Cedar Cover series has even been turned into a TV series. I jumped at the chance to read Blossom Street Brides when I saw it on NetGalley and for the most part I wasn't disappointed. This is a light fun little read with a good stress on the relationships between people and decent character development. It wasn't my favorite book but it was a nice distraction and kept me entertained while reading it. Would I Recommend this Book? : As a "You've got to read this book" probably not but if you were coming up with a list of books to take on vacation this wouldn't be a bad one. Wanting to spank a character and send her to bed without dinner? Oh my! Sounds like a good kind of book to curl up with on a cold day. I've read one of Macomber's Blossom Street novels before and enjoyed it - Blossom Street Brides looks like it would fall into the same sort of category. Great review, Katherine. More that perhaps if that had happened when she was younger she wouldn't be such a brat as an adult! Yes this would be perfect for a cold day or a day with a cold - pretty much any day where you get to spend some time curled up with a blanket and a book! Oh she was awful! If she had been one of the main characters I would've put the book down without hesitation. Luckily for me she wasn't! One thing that I forgot to mention is that it seems like you can jump in at any point in the series. This is obviously a recent book and a lot has gone on prior to this but at no point was I drowning in back story. It's definitely a series worth trying and I'm definitely going to give her other series a try as well.